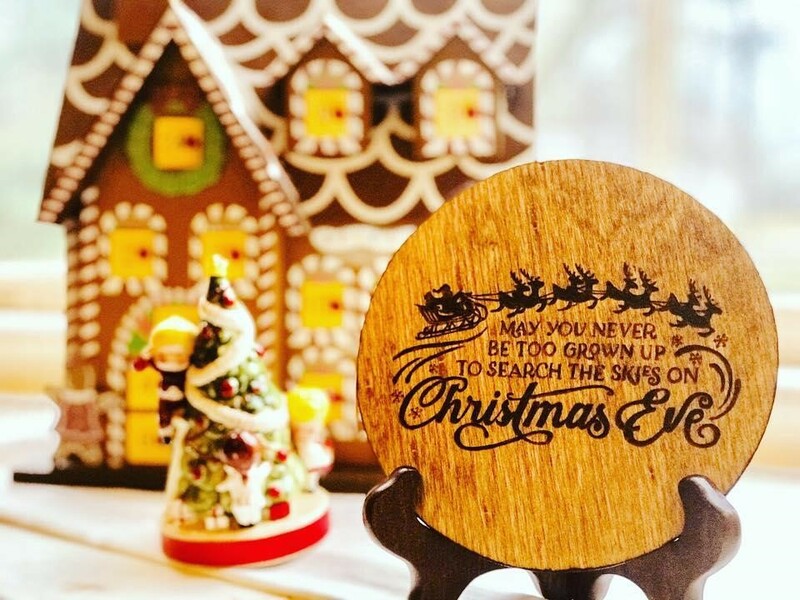 Christmas is literally just around the corner now and what better way to spruce up your decorations with little pyrographed projects with your TRUArt pens? 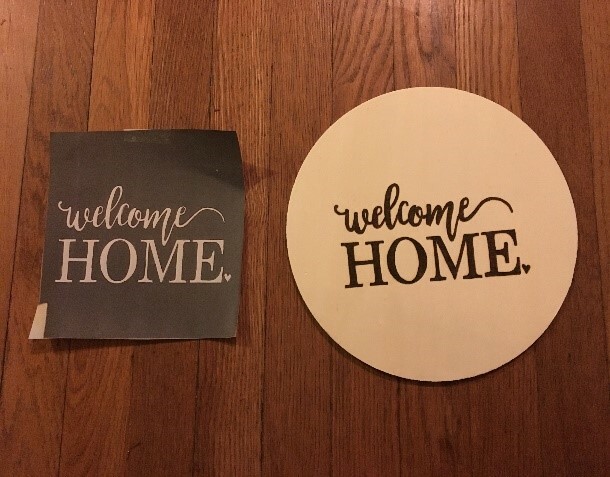 With free stencils of course! Inspired by Andrea’s latest article, “Holiday Gifts”, I’ve collected some images across the web to help you all out. These were picked especially for their simplicity. 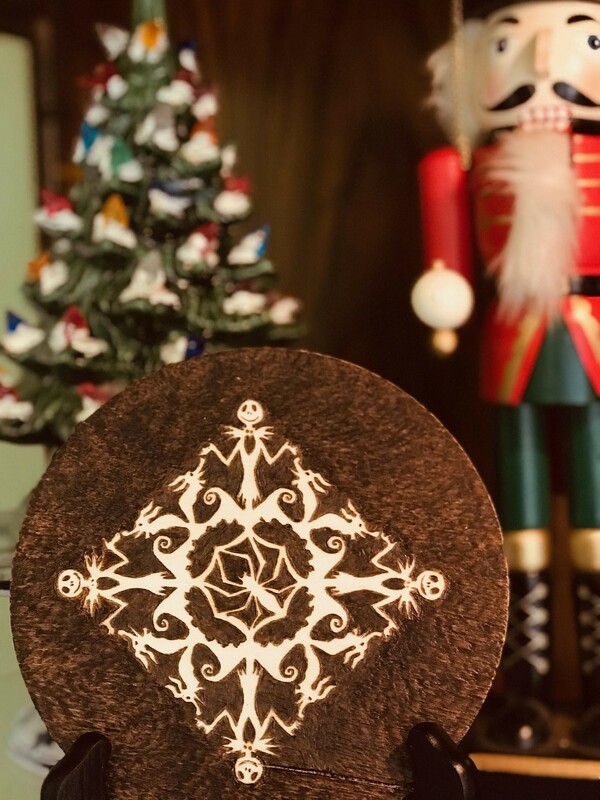 and elegance – where a single picture conveys an unmistakable message of Christmas. 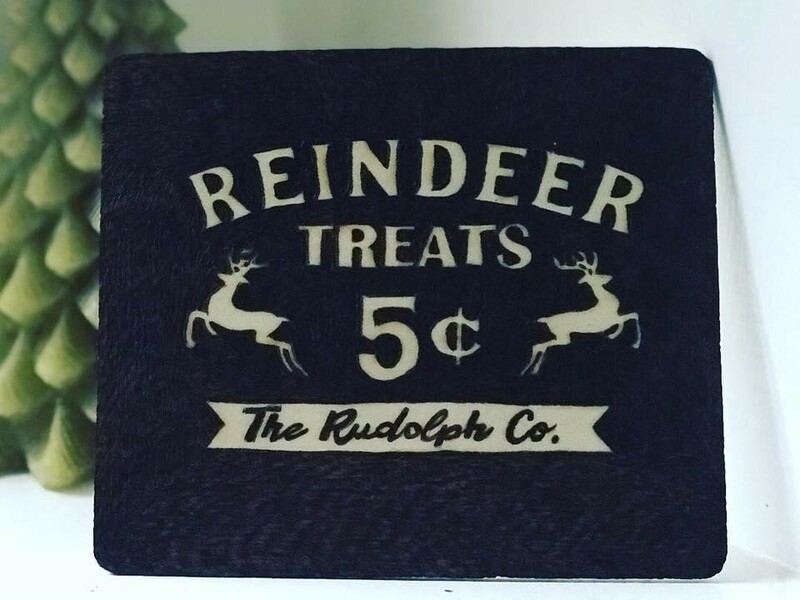 It would be pretty tough to start burning big Christmas-themed projects at this point in time. 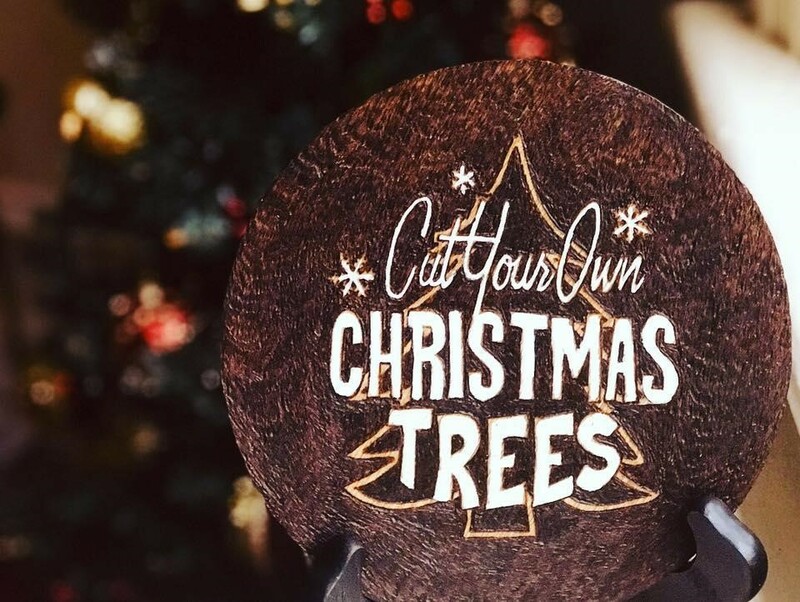 Then I thought instead of going through the agony of waiting for that day to come, why not get the whole family involved in burning little decors to hang around the house and on the Christmas tree? What’s more, these would be a perfect fit for those scrap pieces of wood lying about. You could create discs from small branches or others. 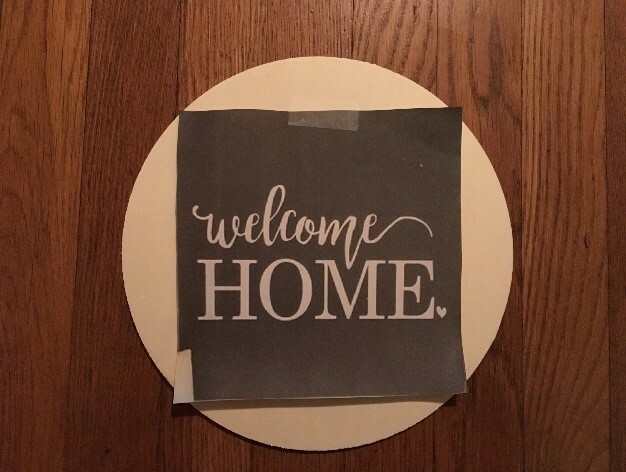 Perhaps use that old scrap rectangular plywood in the basement as a warm greeting board or a little signage greeting everyone who sees it somewhere within the house. Whatever the case, the important thing is that the whole family gets in on it – sharing the Christmas spirit as it were. So hurry and click on the PDF files below and download your stencil. If you need help on transferring images to your work, check out Andrea’s guide. I love the Holidays! The decorations are beautiful, the food is plentiful as well as delicious, and I am constantly busy. 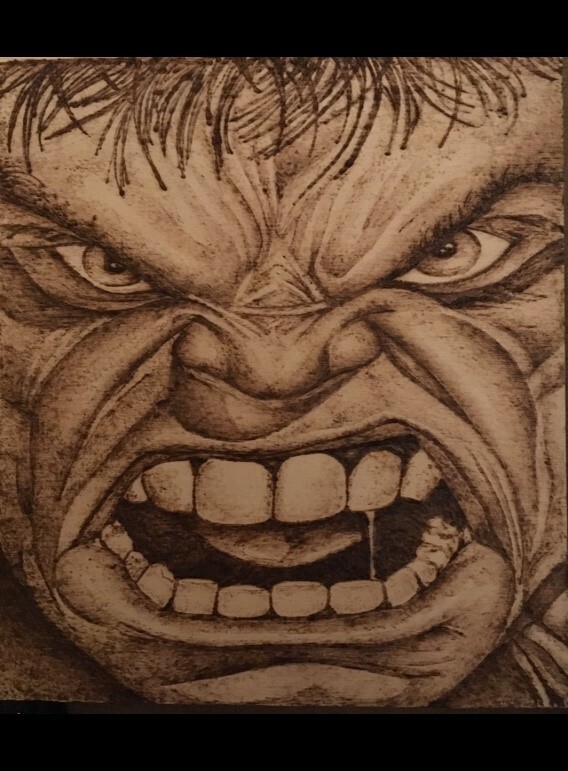 Ever since I started my pyrography business, I have been commissioned to make an unbelievable amount of gifts. If you are looking for some inspiration on creating something beautiful and affordable, I’ve got some amazing ideas. This Holiday Season, go to your local craft store. 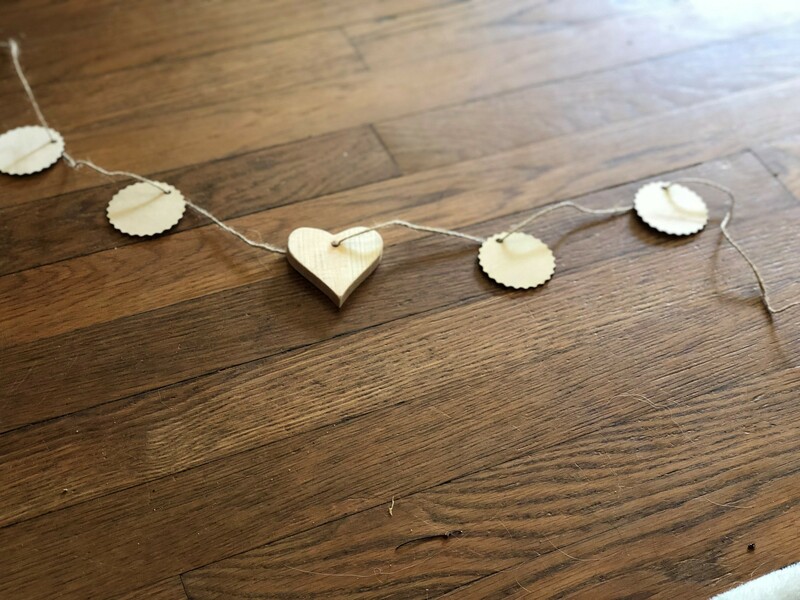 In the wood section, they have a large selection of wood that is easy on the pocket book and there are several items that are packaged with multiple pieces. These stores often offer discounts and many of these items are available in their holiday section which is often marked down. 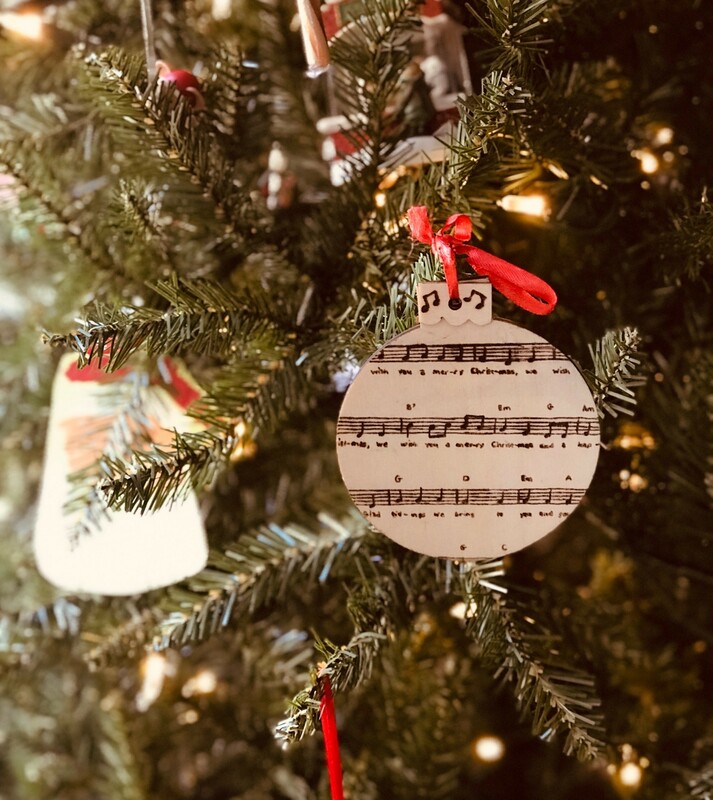 I always create ornaments for my neighbors and my children’s teachers. You can also get some plywood rounds in various sizes that are sold as a set of 4 or more. 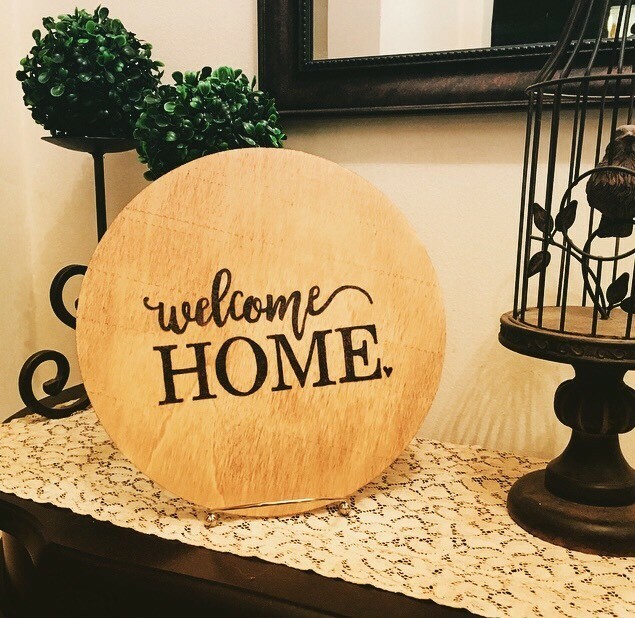 I purchase these plywood rounds along with some stands and they make a great gift for any occasion. 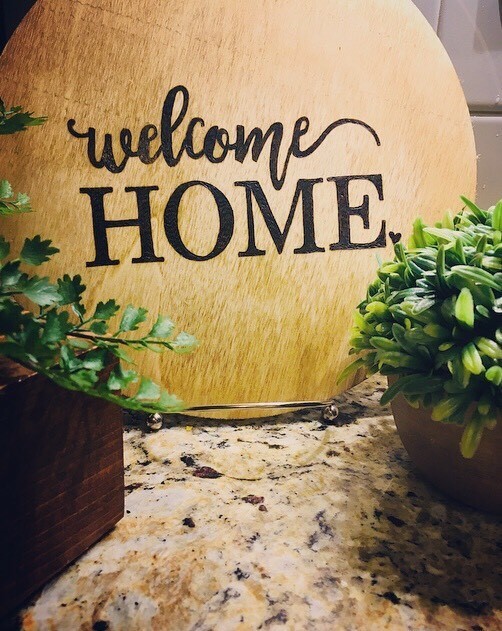 You can create a sign with Holiday decorations or even something a little easier such as an inspirational quote or their last name. 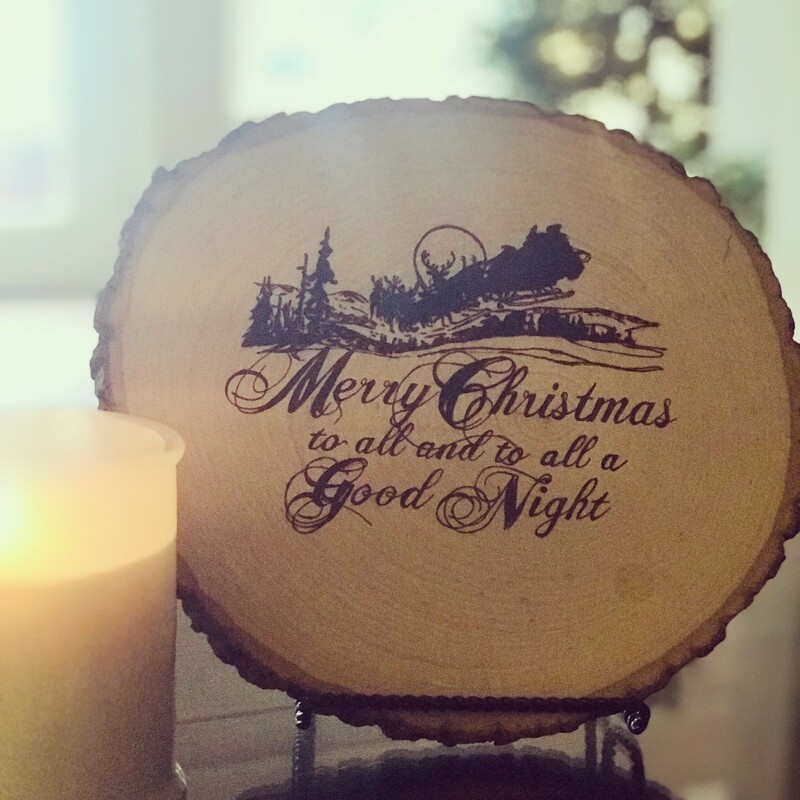 TRUArt also has supplied some easy-to-burn Christmas stencils that you can download for free. I also purchased wood slabs from a local lumber yard for an amazing price. You can find a sanded wood slab, ready to use, at your local craft store as well. These make amazing cutting boards, serving trays, display pieces, signs and chargers for your tablescape. For my sample, I looked online for some clip art images of snowflakes. 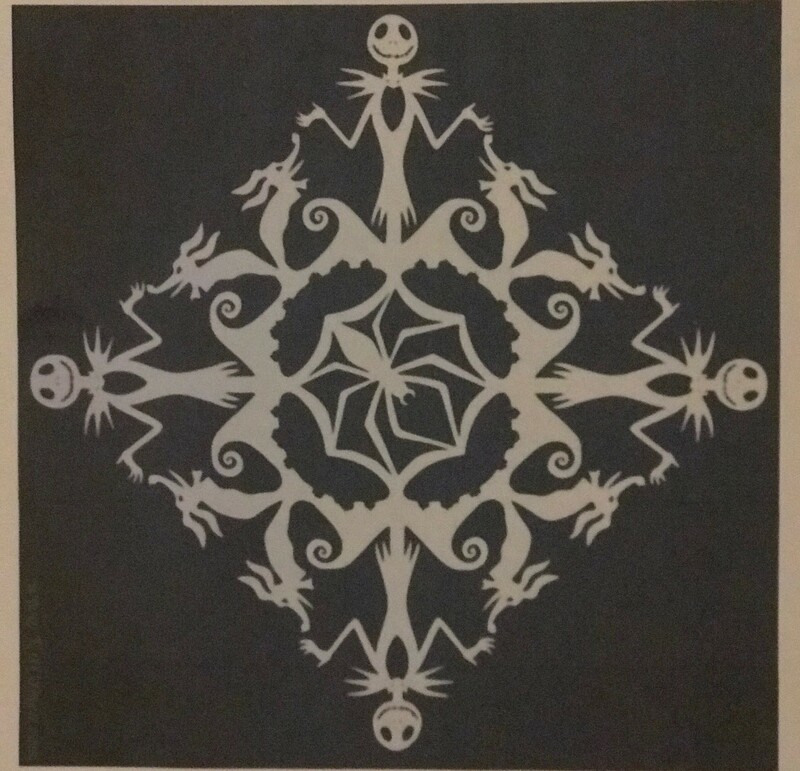 You can also search for snowflake patterns and find other great images to use. 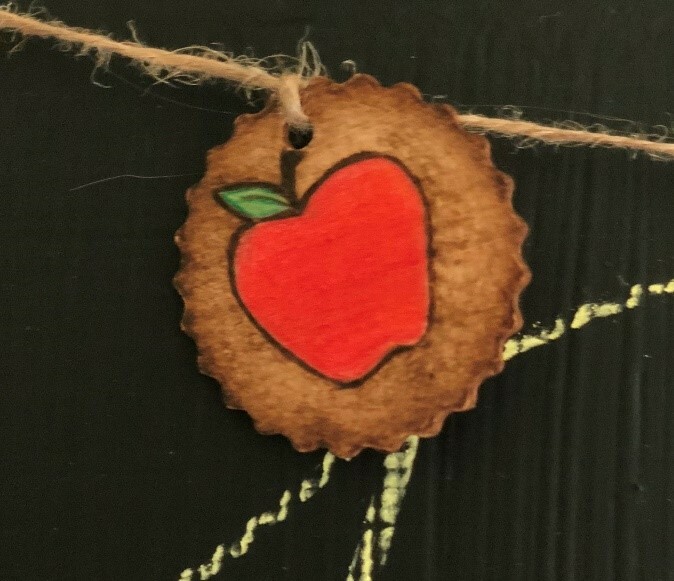 Once you have found your image, transfer the design onto the wood (see my post on Wood Burning Tutorial for instructions on how to do this). There are two ways you can burn this image. 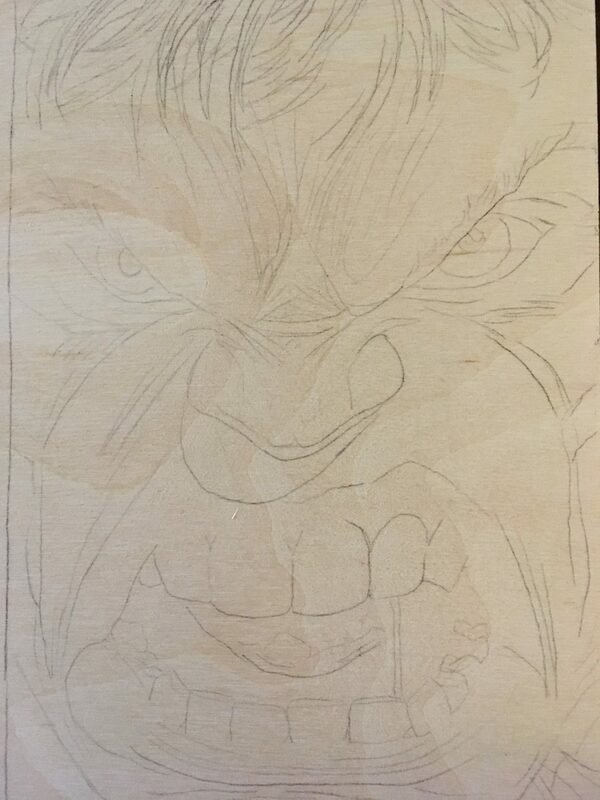 Once you are done with your burning, erase any tracing lines, stain (if needed) and varnish. 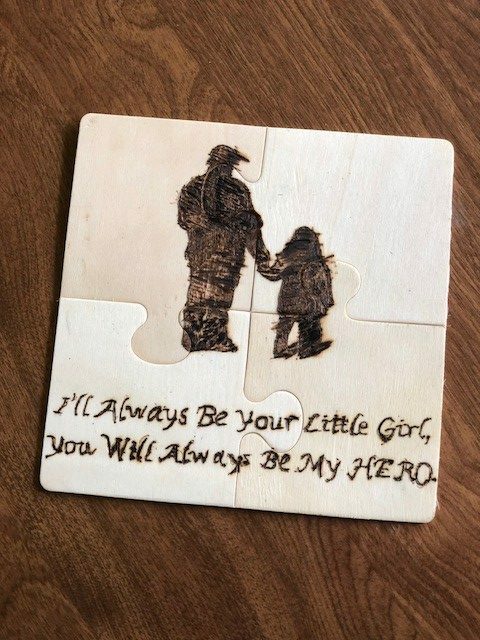 With pyrography, your handmade gifts can have the appearance of a store bought, detailed piece but will be treasured by your loved ones for years to come. 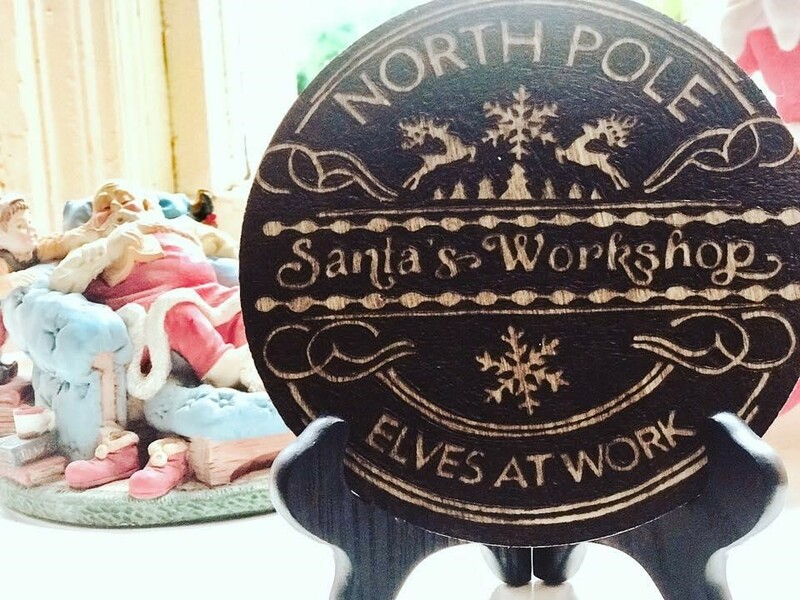 I hope these tips have helped and that some of my ideas have inspired you to create the perfect gift. Lastly, I hope you all enjoy the holidays! See you next time. 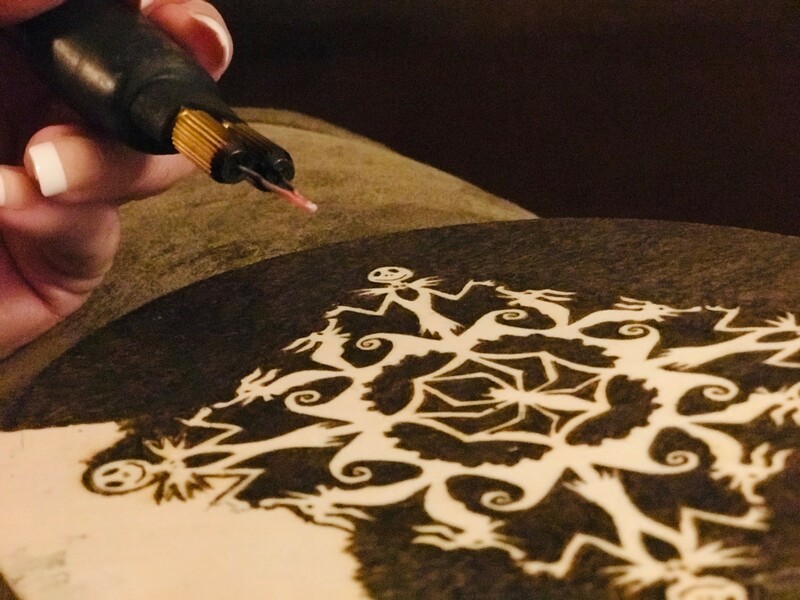 Pyrography or woodburning, is an art medium rapidly gaining popularity especially in the United States and United Kingdom. 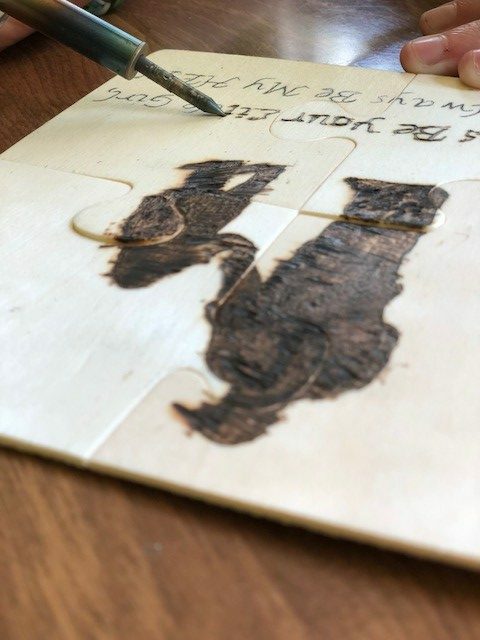 This art medium involves the use of a heating device that resembles a large pen, which, when applied to wood surfaces, leaves distinctive burn marks. 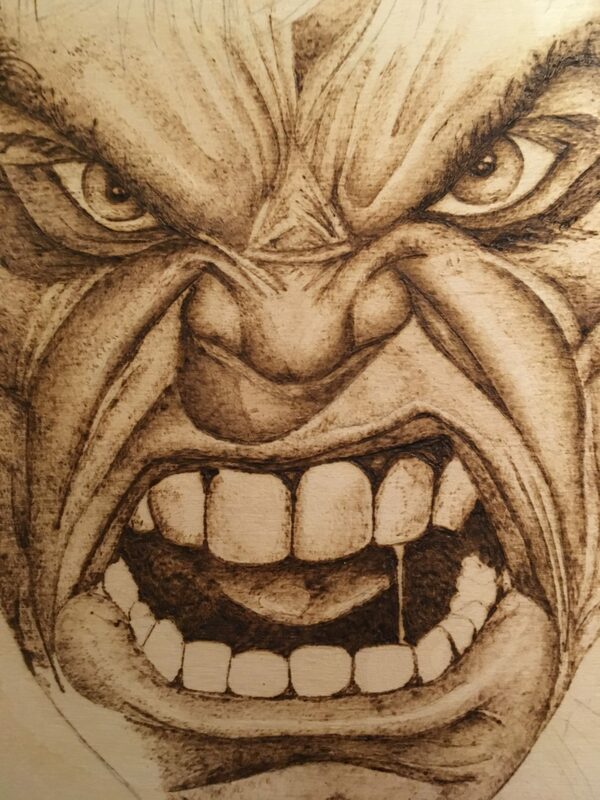 There are already many professional pyrography artists around and most of their work is truly astounding – many even life-like especially when a touch of color is added. 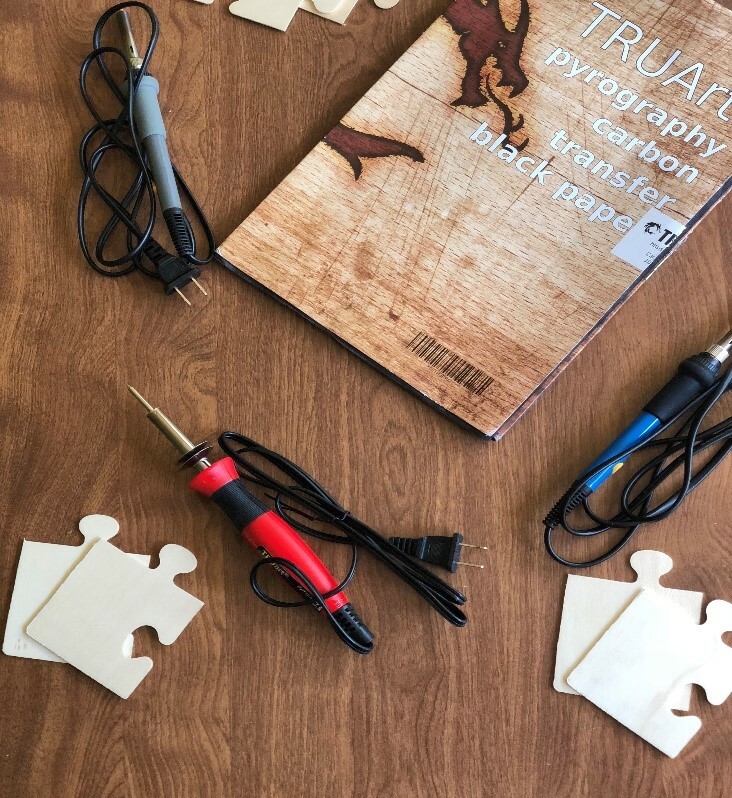 As more and more budding artists join the pyrography band wagon, many do not know what to start off with or know about the differences among the many pens sold out there. This then poses a problem for many who nevertheless went ahead, bought a pen (usually convinced by online reviews) and are either stuck on how to use them properly or end up destroying the tool altogether. 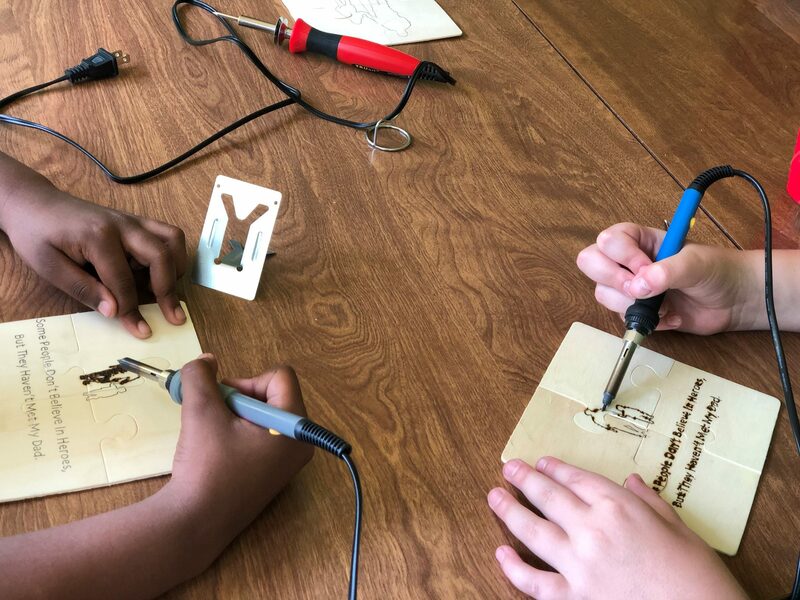 To address that and a few other key issues, let’s compare the two types of pyrography pens, the solid-point burners and the wire-nib burners. 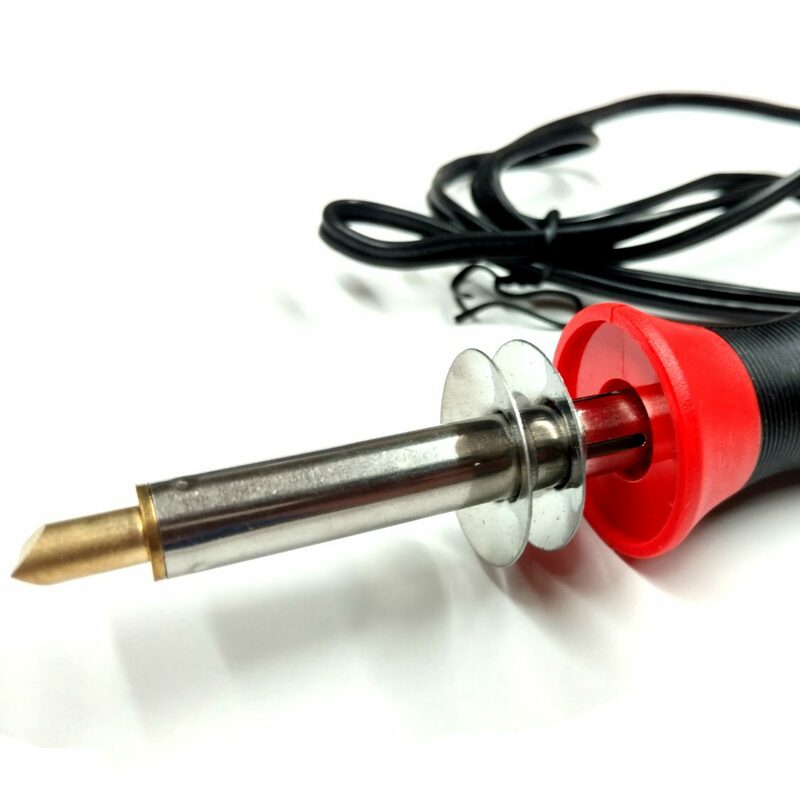 Solid-point burner – This type of pen usually requires a screw-in tip although some very few designs in the market feature non-screw tips held in place by a sleeve and a nut. Care should be taken when purchasing extra tips as they can vary in thread type. 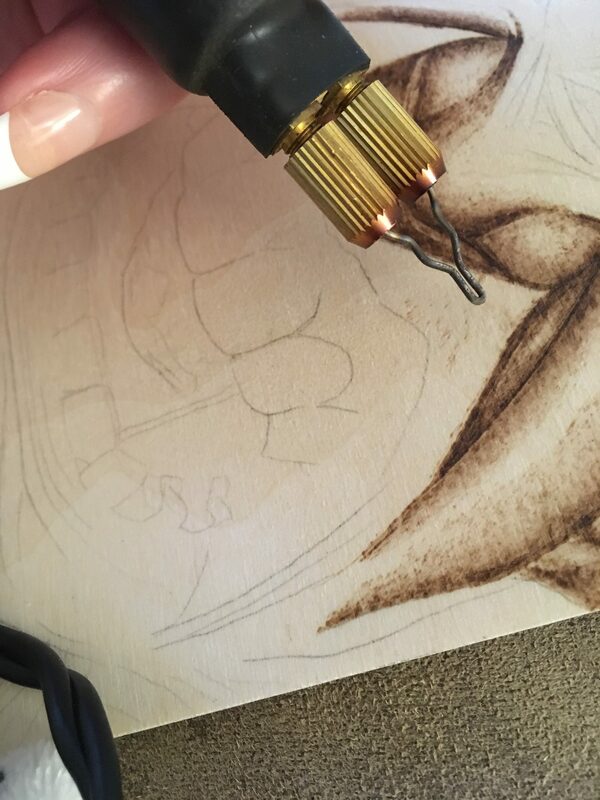 TRUArt pyrography pens use M4 X 0.7 tips. This means that the thread is 4 mm in diameter with a 0.7 mm thread pitch. These tips are screwed in tightly by hand and usually finished off with 1/8th to 1/4 of a turn using a pair of pliers. Wire-nib burner – This type of pen holds wire tips usually made from Ni-chrome wire of varying gauges. 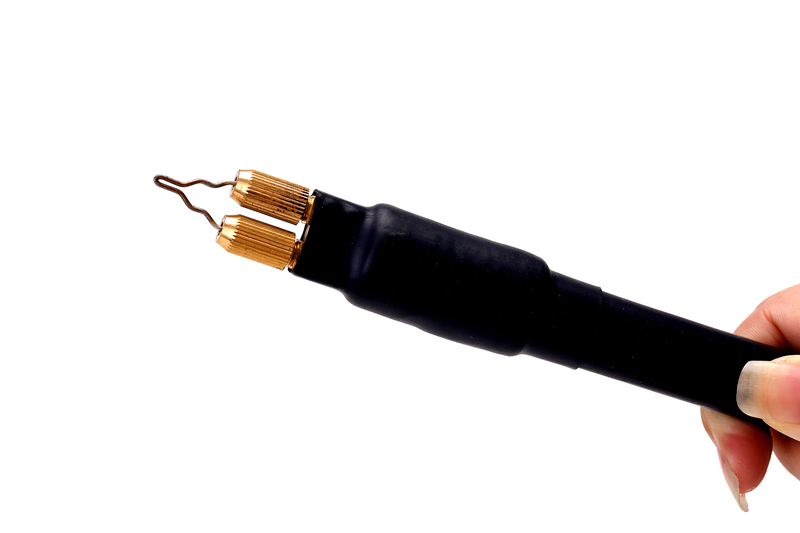 The wires are either inserted into collets or held in place by screws tightened unto them. TRUArt’s 60 W Professional Woodburning Detailer can accept 20 to 16 GA wire tips. Solid-point burners create heat by means of a heating element within the pen that is then transferred to the tip and operate at a fixed temperature. Wire-nib burners create heat on the nibs by electric current going through it. The collets or wire nib holders should never be shorted. No danger of shorting out the pen Brass becomes soft when heated. Oftentimes, beginners tend to put too much pressure on it instead of letting the heat do the work. This bends the softened brass tip, which leads to breakage – leaving the screw inside the pen and rendering it useless. Ultimately, when selecting a woodburning or pyrography pen, you will first have to consider what you intend to do. Figure out if you could see yourself doing this occasionally or often. 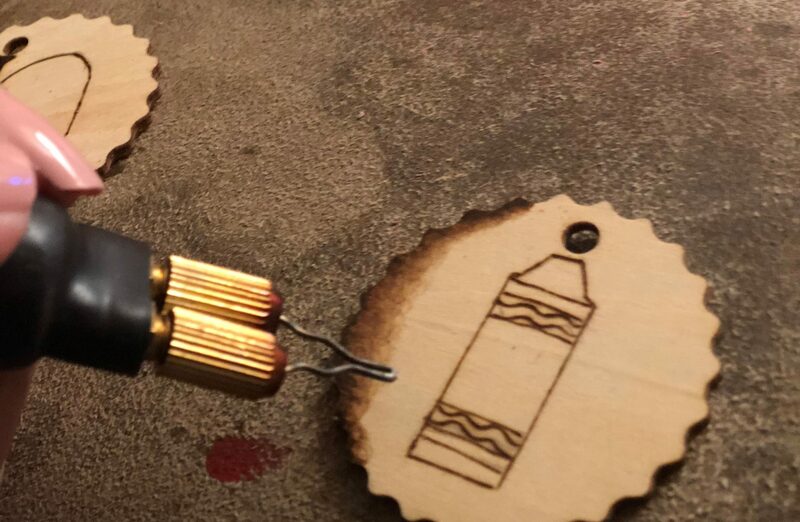 If you’re just starting out in the art of pyrography and do not know what kind of pyrography pen will suit you, you’re safe if you start with the Solid-point burner. Later on, once you’re more confident in the art and start investing long hours into it, you may want to consider upgrading to the more robust and industrial strength of the Wire-nib burner. If you still want to know more, simply share your thoughts or questions through the comments below and we’ll answer them within the day. 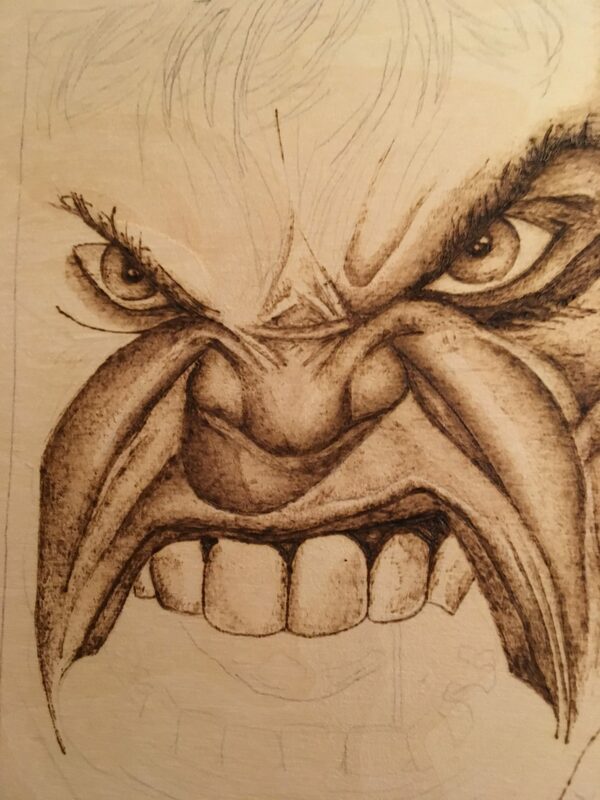 Sometimes, in pyrography, trying to find the right image to burn can be extremely tricky. 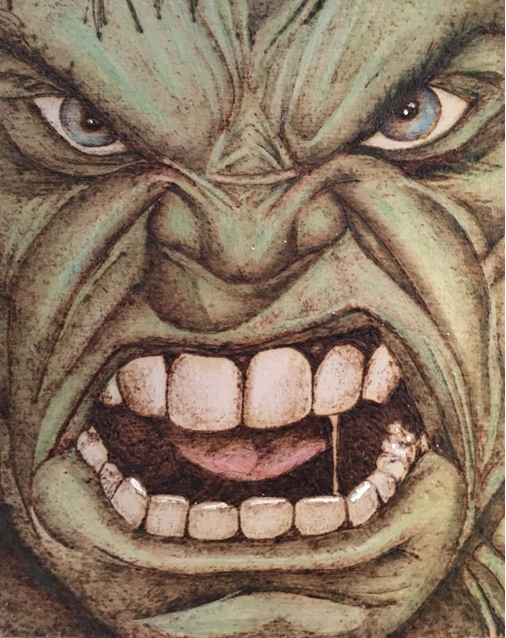 When you are an artist, copyright laws can make it challenging to find a great image to burn. 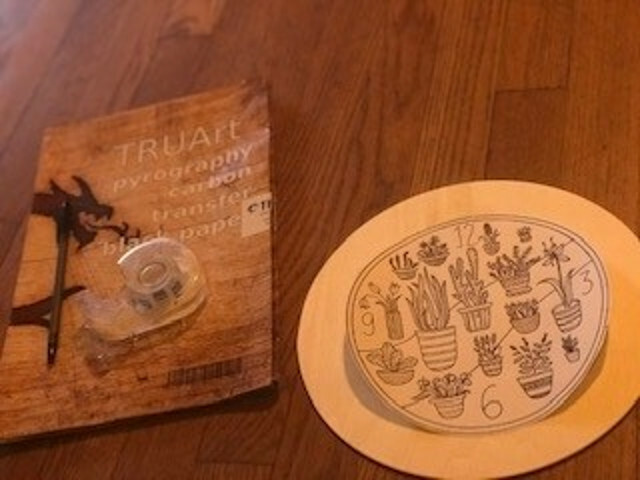 Fortunately, now TRUArt has FREE printable stencils available. 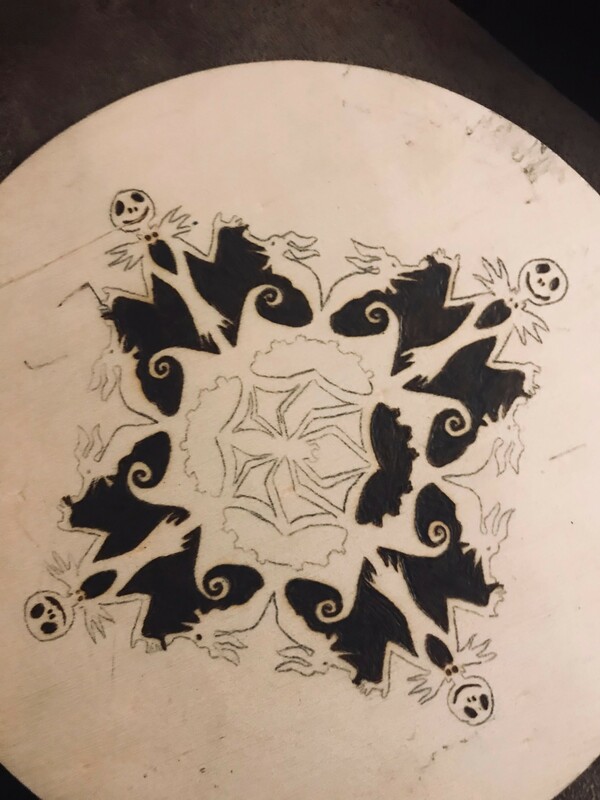 Once I came across these stencils, I couldn’t wait to get started. 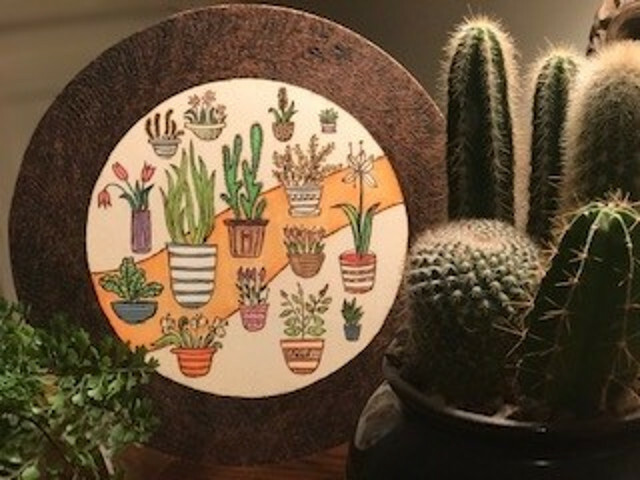 There are several unique designs available to download but, ultimately, I decided on this cactus stencil. 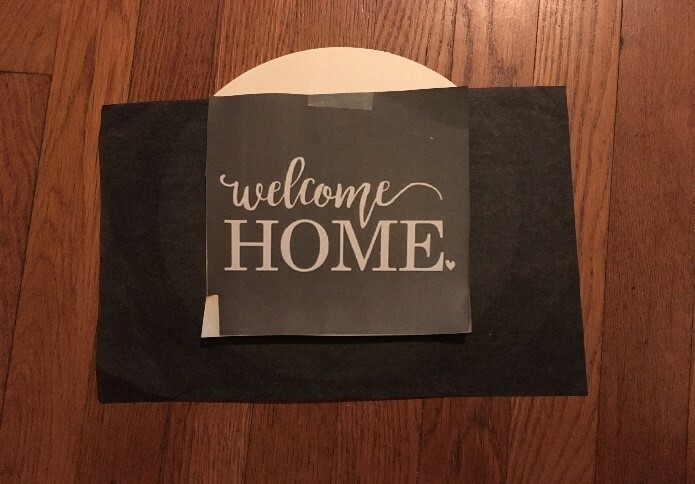 This stencil is available under the clock category. 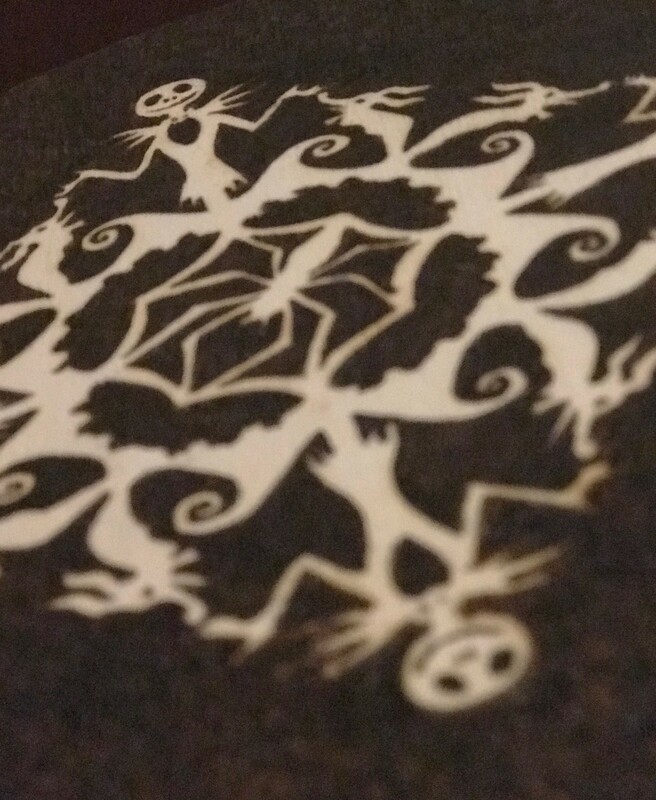 I loved the pattern so much that I modified the stencil to make it my own and decided not to trace the numbers. I found this stencil to be a quick and easy burn. This is a great project to do with your family. 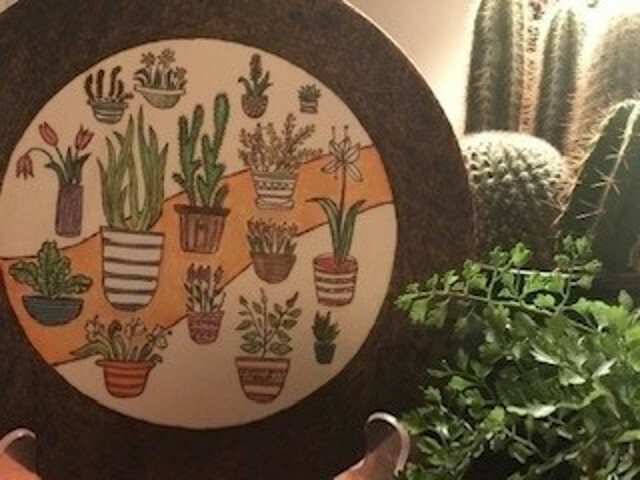 My children had fun picking out the colors of the various pots and helped me find the right shade of green for each plant. 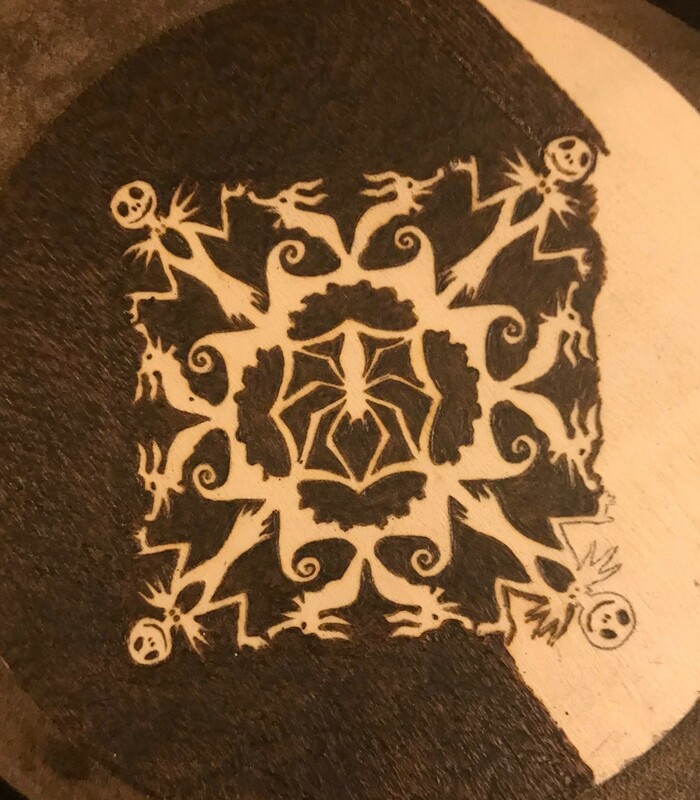 We spent the day going over different stencils and both my children found something that appealed to each of them. Once the image was burned and colored, I decided to give the background a nice, thick solid burn. This technique gave my burning some depth and made my image pop. I was extremely happy with the ending result. This was a fantastic family project that is exciting for children to do. 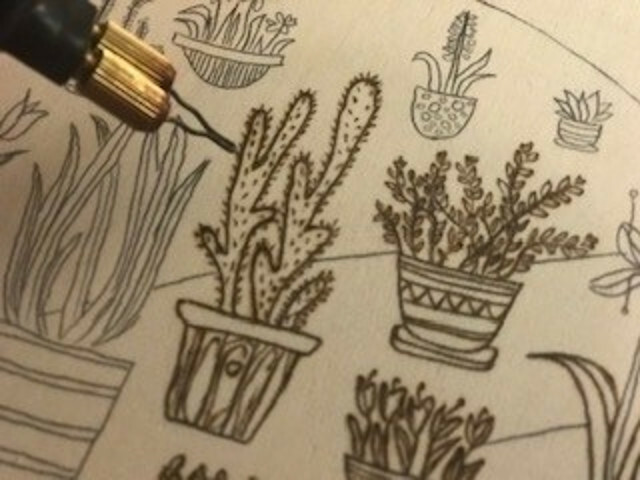 These prints are also a useful tool to help you practice your pyrography skills. 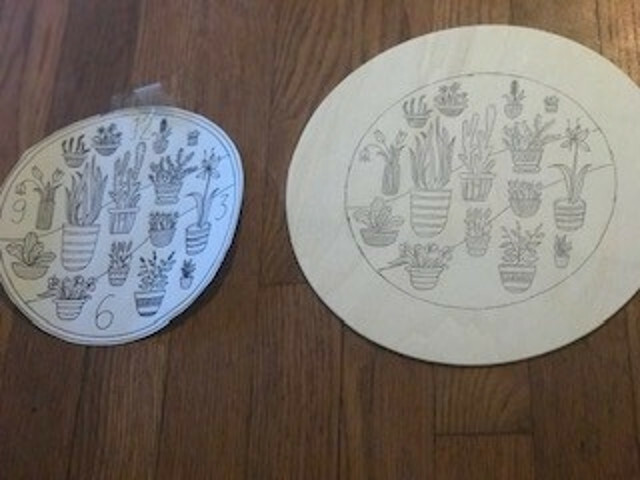 My children loved working with these stencils and they are both excited about working on our next burning together. 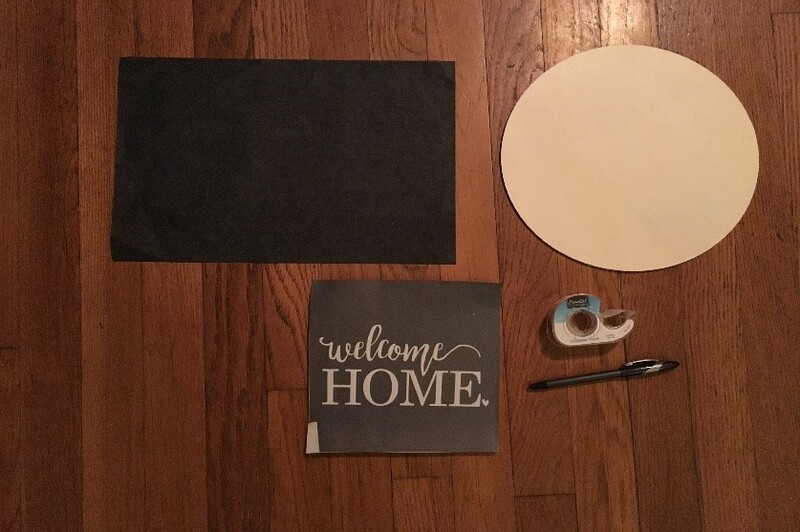 This is a fun and quick project to make for any teacher. Get your kids involved and let them help burn and/or create the designs that are used for this banner. 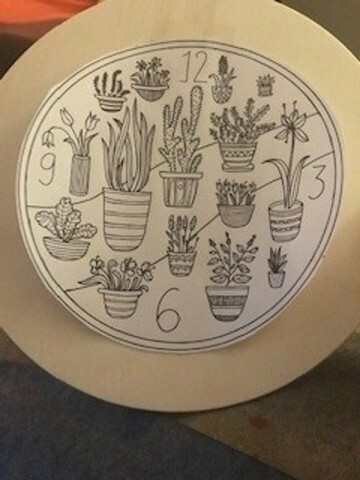 To start, draw or trace some items that are commonly associated with school (for tracing tips, check out my previous post Wood burning Tutorial). Keep the drawings simple. 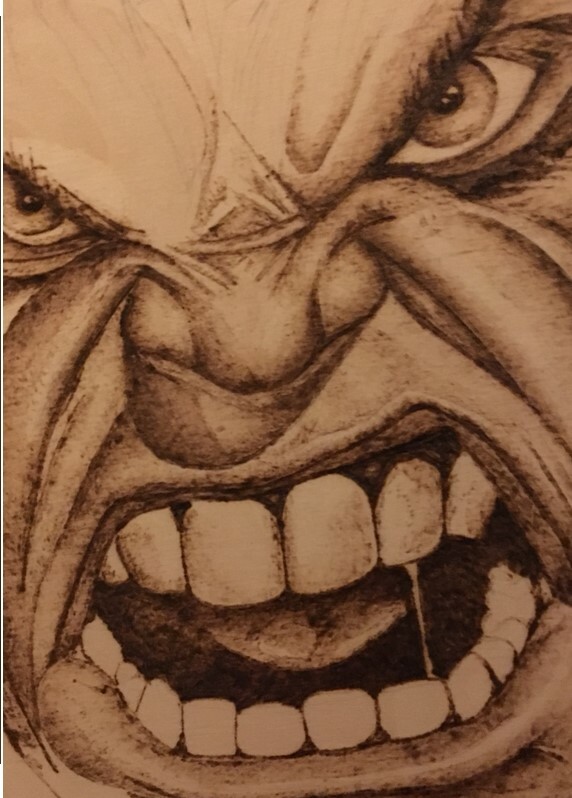 Make sure you only use one drawing per work piece. 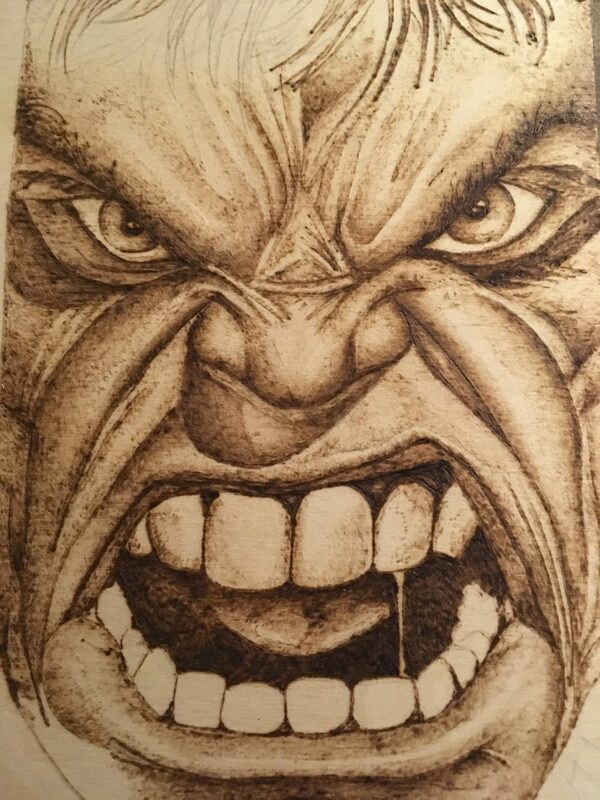 Outline your image with your pyrography pen. To make your image pop, I recommend burning the background. You can make the background a solid dark burn or you can do some light shading (for shading tips, check out my tutorial Shading Technique). Once your burn is complete, add some color to your wood. String your wooden circles on some twine. Once you pull one circle through, knot it at the top of the hole to keep the wooden piece from shifting. 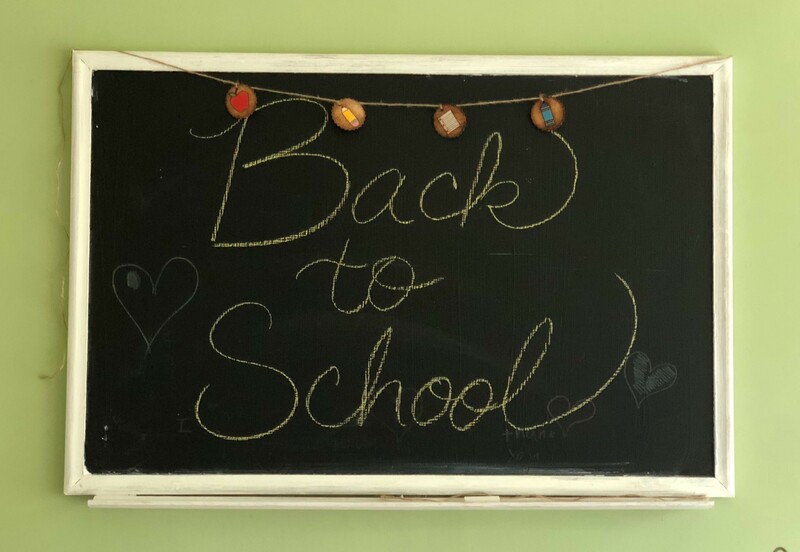 Give this to your child’s teacher as a sweet “Back to School” gift. 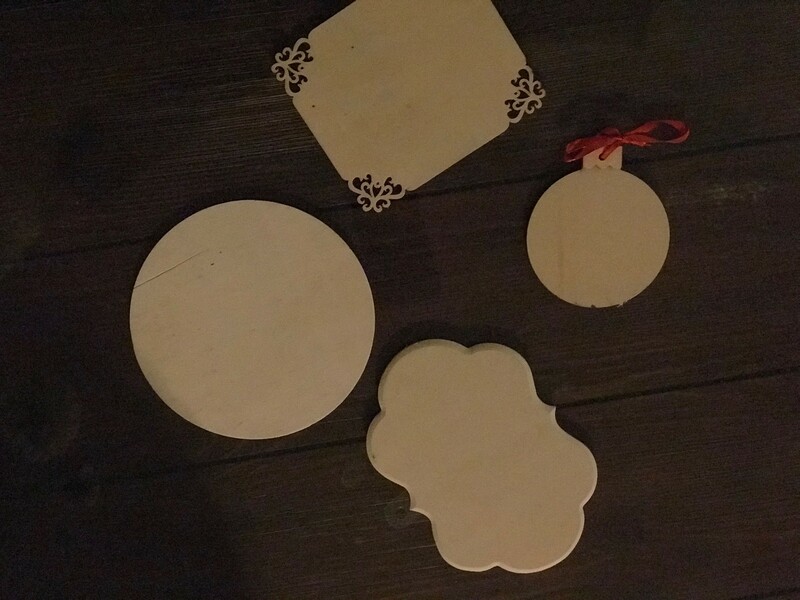 If the banner is not for you, as another option, you could use these wooden circles as an ornament or they could even be used for decoration on a wreath. Practice with different designs and see what works best for you and your kids. If you have any questions whatsoever, please leave them on the comments below and I’ll get to them as soon as possible. 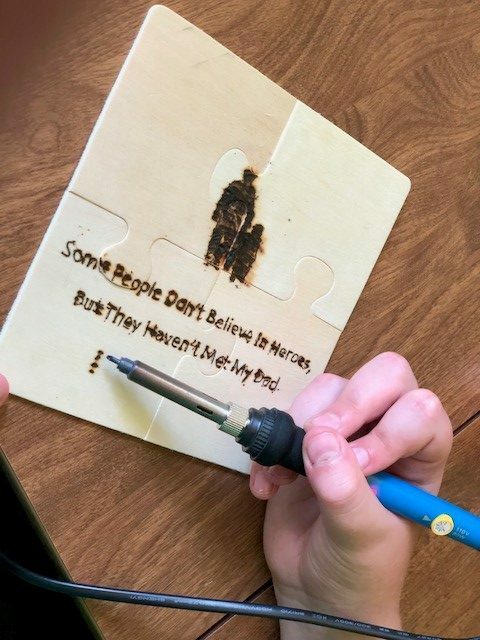 A great way to bond the whole family is to work together on a single woodburning project. 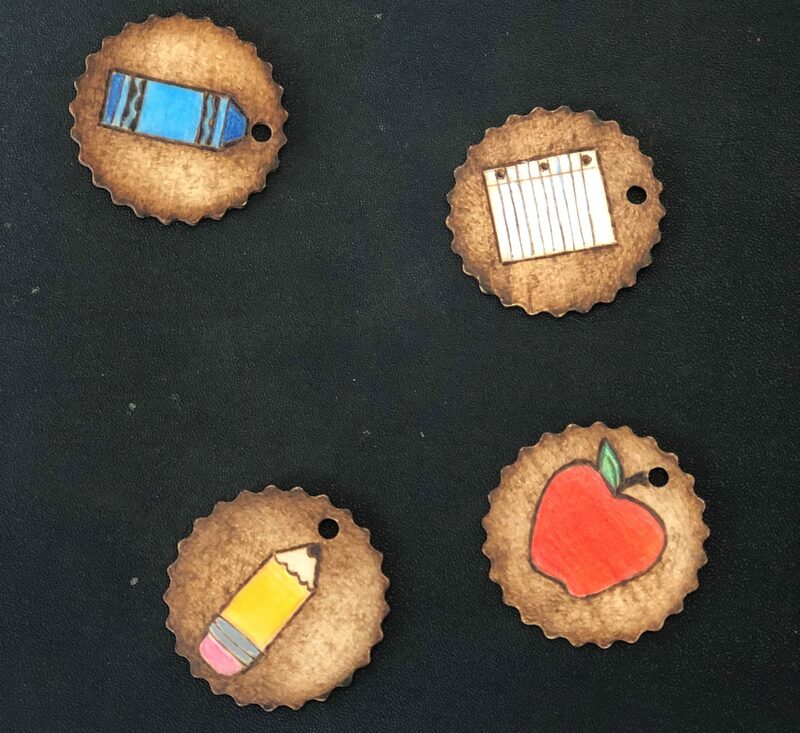 Yes, pyrography can be for the little ones too! 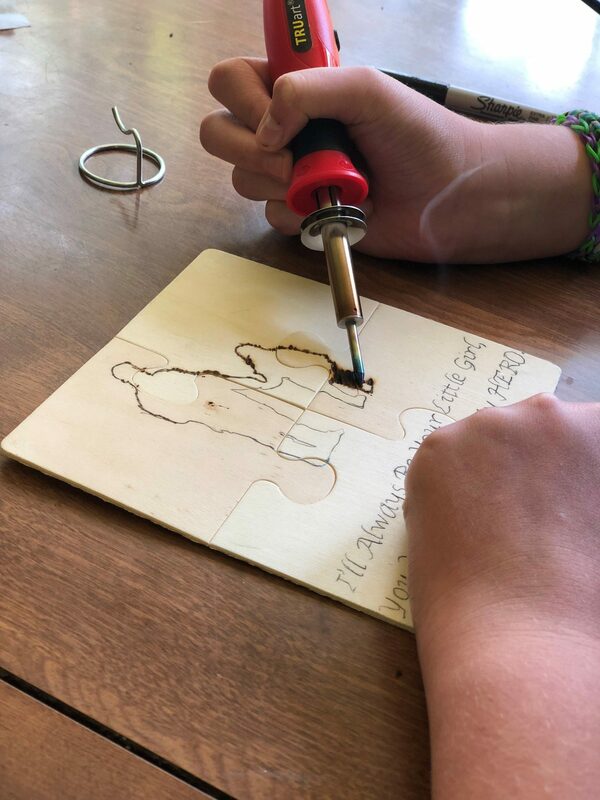 Never let a child use a pyrography pen unattended. 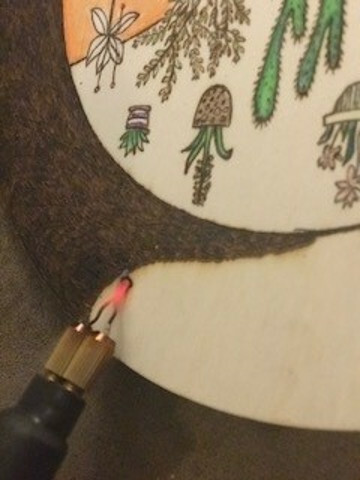 An adult must always be present to supervise since pyrography pens get hot – VERY HOT. Be sure your child holds the pen by the rubber handle and never touch near the tip of the pen. 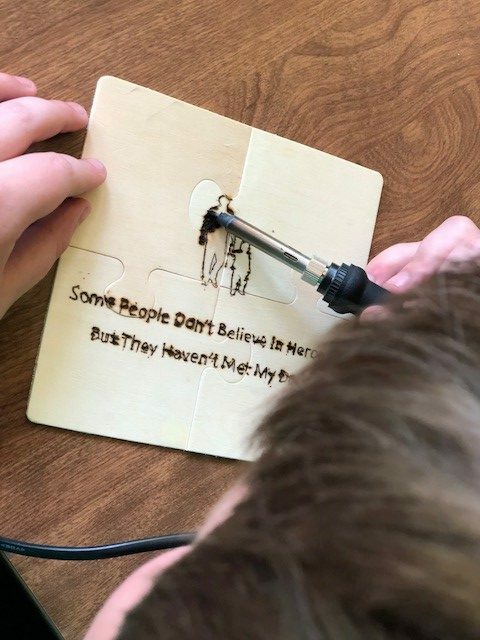 If you or your child is not actively burning with your pen, keep it propped up on the stand that was provided with your TRUArt pyrography kit. It holds your hot pen securely and you don’t have to worry about it accidentally touching anything else. Always make sure your pen is turned OFF and unplugged when it is not in use. Allow some time for your pen to cool off completely before handling and storing it. Remember, these pens are HOT. This is not a toy and must be used with caution under adult supervision. 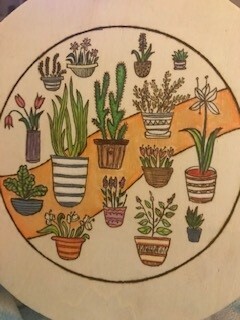 One thing I find exciting about pyrography is that anyone can do it! 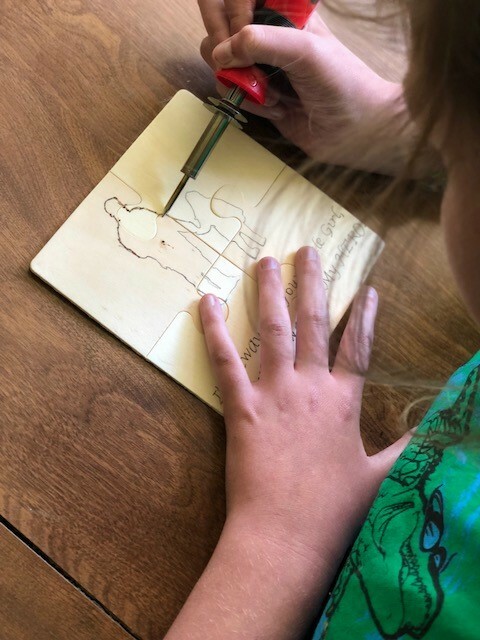 Children in general love to draw and enjoy creating something special for the ones they love so I wanted to find a project that would be fun and easy for any age to try. 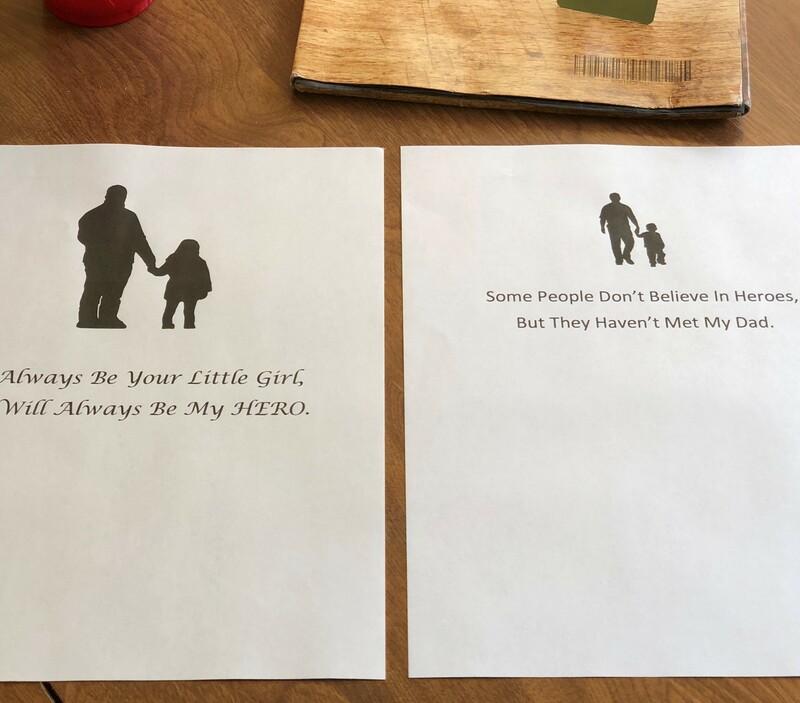 With the help of my three little artist volunteers, we scoured the internet for quotes or phrases that sounded like something they would want to tell their father. Once we had the phrases picked out, I typed up the words on a Word document. 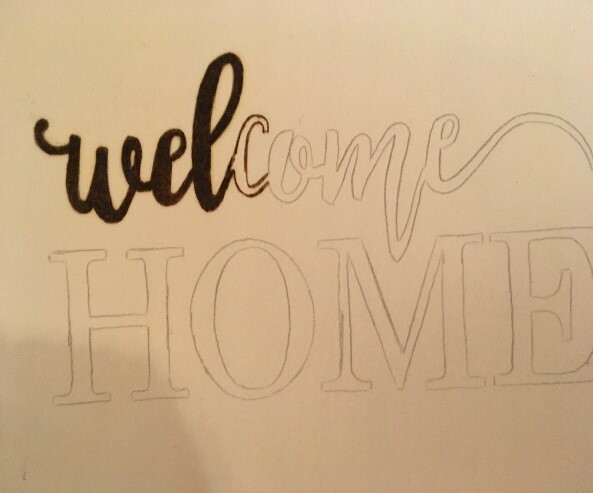 I let the young artists pick the font that they thought looked best for their artwork. Larger fonts work best as does thicker lettering. 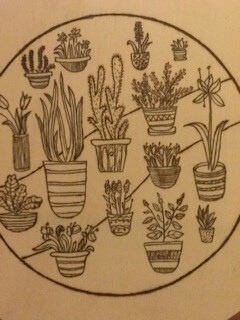 I then looked for some simple clip art to add to the document – nothing too difficult for our young artists to handle. Once you have everything picked out the way you want, scale everything down to the size you need to fit the wood. 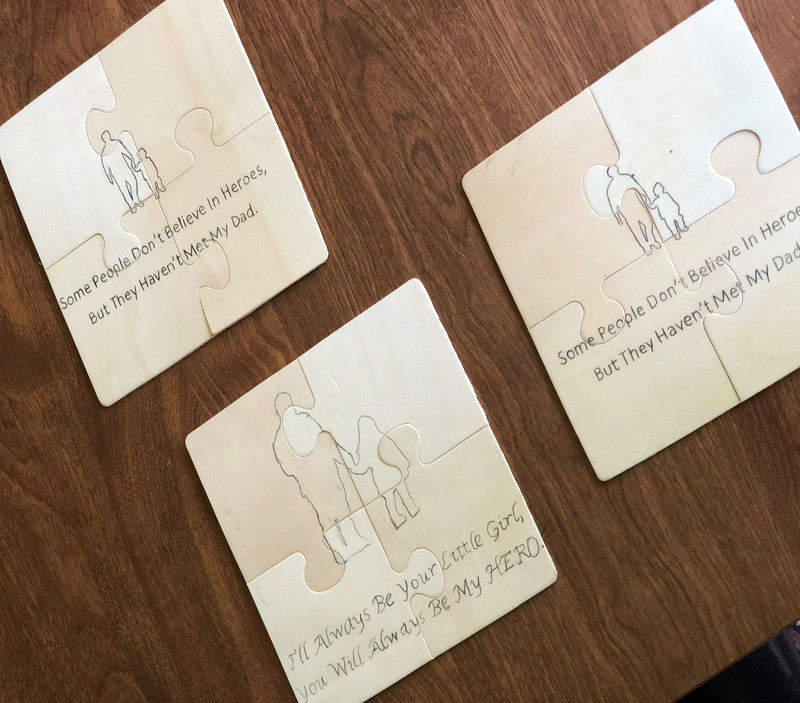 Print your image out and then either you or your child can trace the image onto the wood. 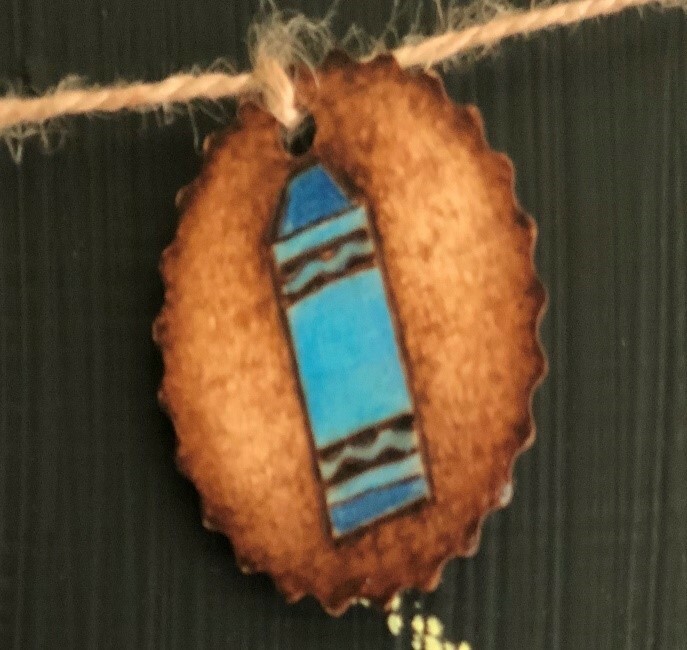 If you’re not sure on how to do this, check out my previous post Woodburning Tutorial. Once the image is traced, remove the carbon paper and tape. Start burning. When burning, children tend to press down hard with the pen. This can cause hand cramping as well as burn splotches on the wood. If this happens, don’t worry. Remember, they are just children. Let them have fun enjoying the process and reassure them that it happens to everyone every now and then. If burn splotches do happen, this usually means the temperature is too high and needs to be adjusted. Be sure that an adult adjusts the temperature of the pen, never a child. Sometimes, the grains in the wood may prevent a smooth burn for the young artist. The grains may cause some stray, crooked lines. It takes practice to learn the right pressure and heat to use while burning. Embrace the flaws. Remind the young artist to have patience. They are learning and it will get easier with time. Observe their excitement as they burn into the wood. After all, this is about having fun while learning a new art form. Occasionally, you may see some smoke come up when the pen touches the wood. This is normal. This usually happens if the pen is too hot or when it is pressed hard into the wood. Be sure that the child does not keep the pen pressed onto the wood for a length of time. With these pens, you are burning the wood so a hole can be burned through if you’re not careful. As the adult, you may need to assist the child with holding the pen. It is thicker than regular pen and the child may be scared at first. That’s ok too. Safety is the main priority. 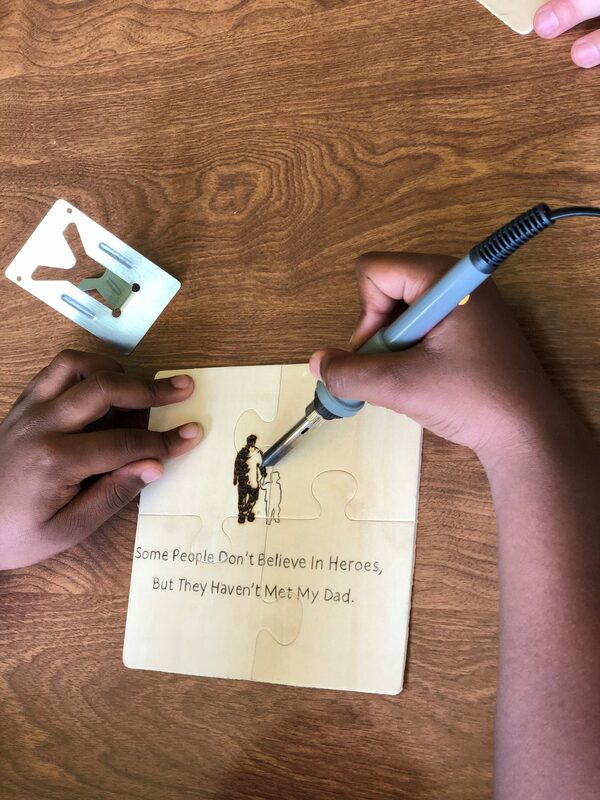 Most children are nervous the first time they use a pyrography pen. Once they start burning, they usually become comfortable with the pen rather quickly and end up loving the process. Guide them, help them and supervise them. Allow them to have fun creating something unique and special. 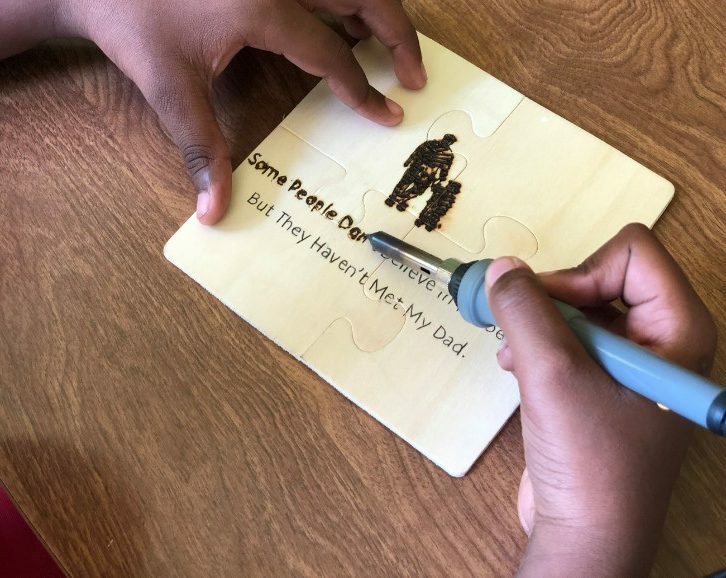 When the burning is complete, you can give them a pen to write their name down or personalize a message. 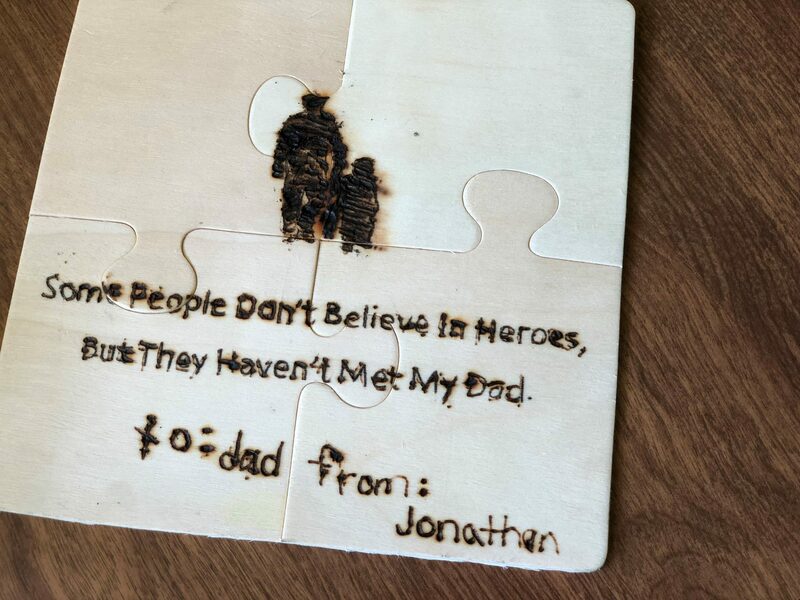 Practice wood burning with your children often. You’ll be amazed at how quickly they adjust to using the pens. Be patient and know that mistakes will be made, it’s just part of the process. Always follow the safety tips and have fun. Got any questions? Just leave them in the comments below and I’ll get to it as soon as possible. Shading is a challenging but extremely rewarding technique to master. Shading gives your drawing depth and illustrates the various levels of darkness. When you use this technique, you can make a flat image instantly have the realism of a 3D image. When practicing, use a sample piece of wood. 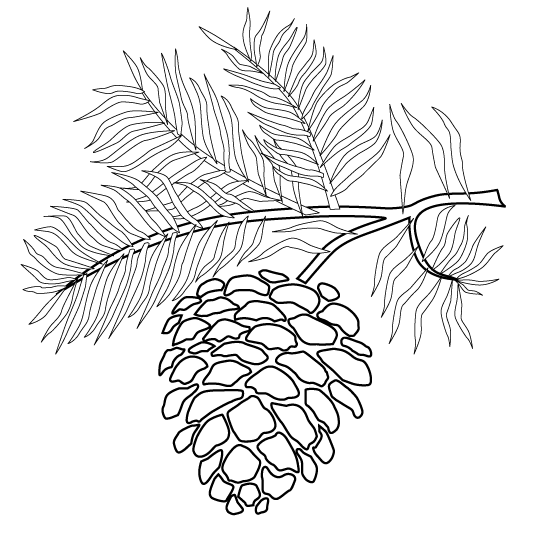 Practice your shading by using simple shapes or designs. Another useful tip is to study black and white photographs to observe where the light and dark values land on the image. 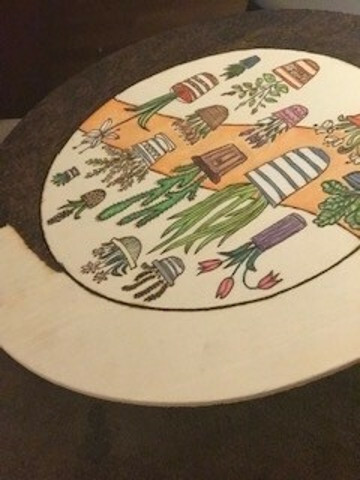 To start, draw your image or design onto the wood. 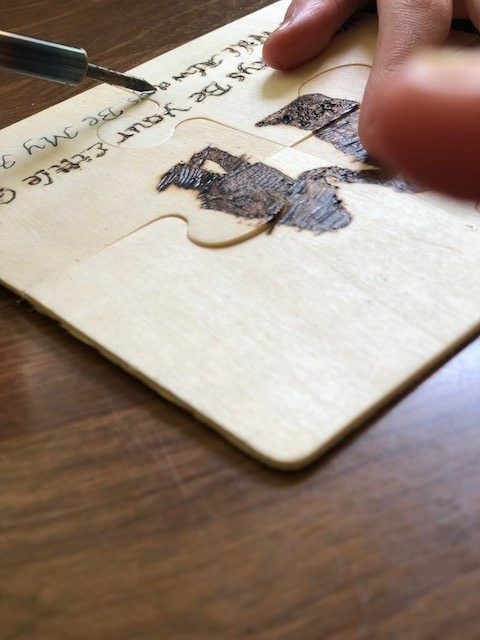 With pyrography, there is no room for error. All marks you make are permanent. In general, you should start burning your image at a low temperature and gradually increase heat as needed. When burning, always burn softly. To do this, do not press down hard with your pen or make solid harsh lines. I like to burn on a low temperature and make small, tight, circular motions on the wood. I continuously do this until I blend my markings into a light, even shade. You should not be able to distinguish where the shading started or ended, you want it to all flow together. Do not outline your image completely with dark, solid lines. The point of shading is to give your art realism and it also helps define an object. When shading, you don’t want your dark value to be too similar of a shade to your lighter value. Sometimes, it helps to practice shading on paper with a pencil first. This can help you get a feel of how to transition from dark to light values. When burning, move your pen in a slow, even motion. Add layers to your burning to give it depth. Increase your burner from a low temperature to a medium low temperature to the areas needing a darker value. I hope these tips will help you master the art of shading. Practice frequently and find what works for you. 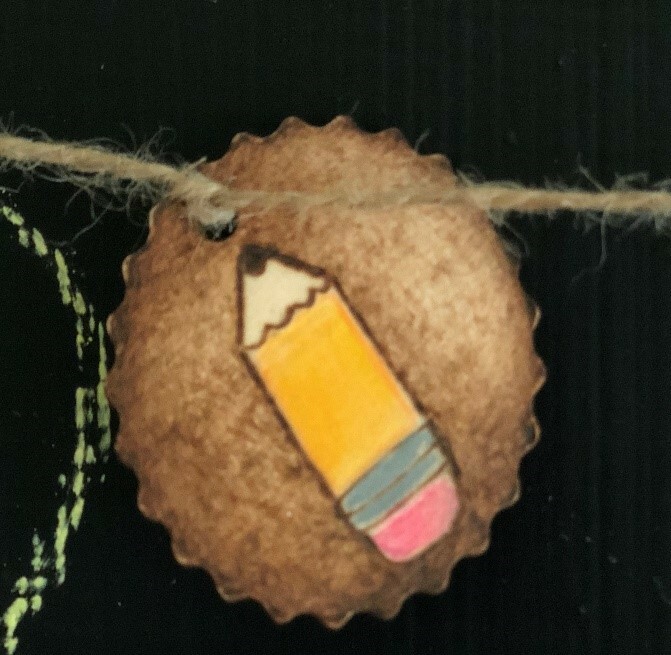 Experiment with the different tips that are provided with your pyrography pen. Different tips may help assist you with your technique. Most importantly, take your time. This is not an easy thing to do if you are not familiar with this skill. 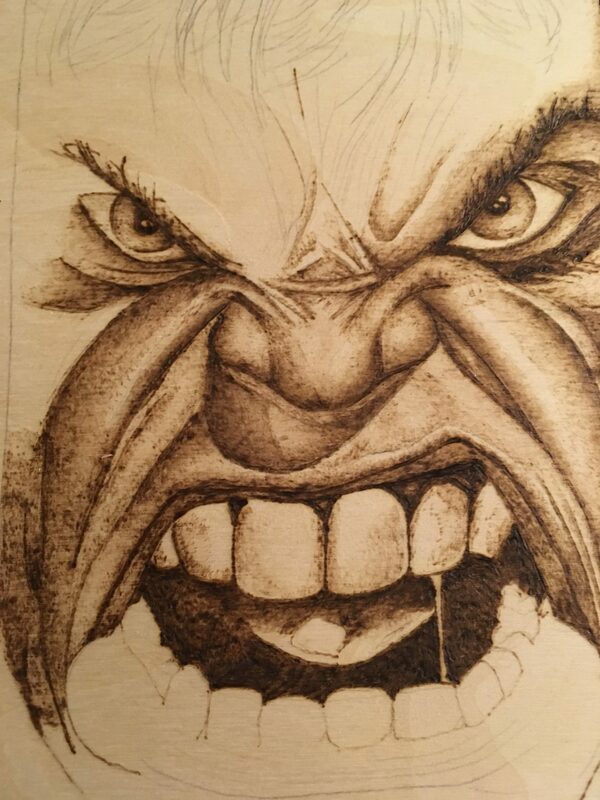 If you have any questions regarding this technique or anything about pyrography shading, please leave them in the comments below and I’ll get back to it as soon as possible. 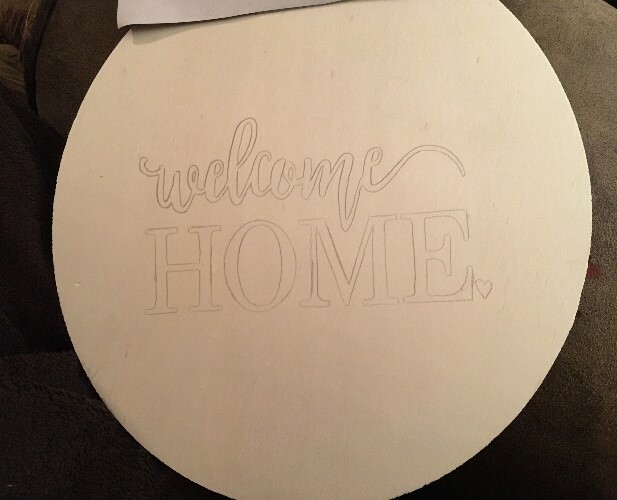 If you are looking for a way to create a very beautiful and professional looking wood burning, I have some tips to assist you along the way. Take the time to find the right image to burn. Make sure the size of the image works well with the piece of wood you choose. Be mindful of the type of wood you choose. Try sticking to a soft wood such as birch wood, basswood or even a simple plywood. Sand your wood surface down prior to use to ensure that the image you use will burn evenly. Do not burn on treated or painted wood. This can be harmful to your health if the fumes are inhaled. Get some tape, carbon paper and a colored pen. Find the center of your wood and place your image on the desired location. Tape the top of your image onto the wood to prevent it from shifting. Slide the carbon paper underneath your image (glossy side down). Take out your pen and trace the image. I like using a pen because I feel like I don’t have to add as much pressure while I’m tracing the image. It is useful to use a colored pen so that you can see the area that was already traced. 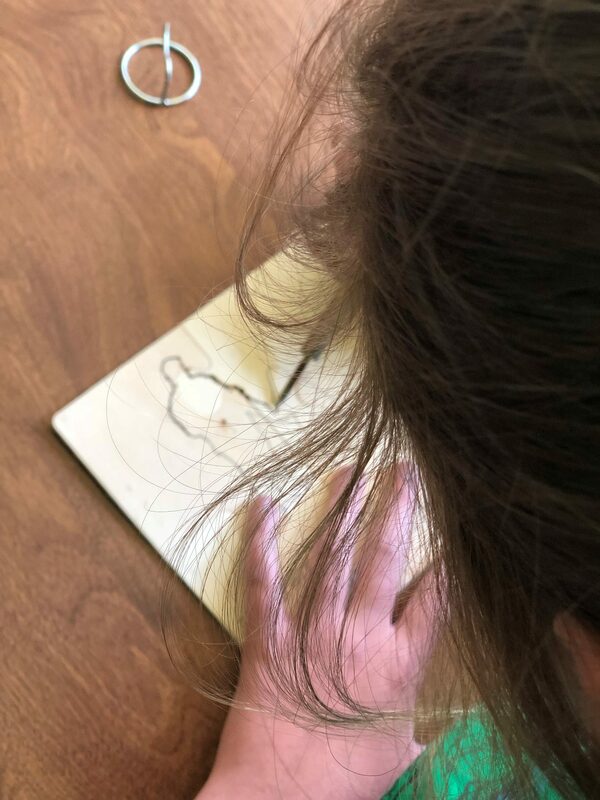 Once the image has been completely transferred, gently lift the bottom portion of the design to ensure that you have traced the whole image onto the wood. If so, remove the paper. When burning the image, start at a lower heat and slowly increase the temperature as needed. If you start too hot, you will get an uneven burn and possible burn marks outside your design. Do not press down hard while burning. If you feel the need to push down hard on the wood with the pen in order to get the desired darkness/shade, your temperature is too low and needs to be increased. 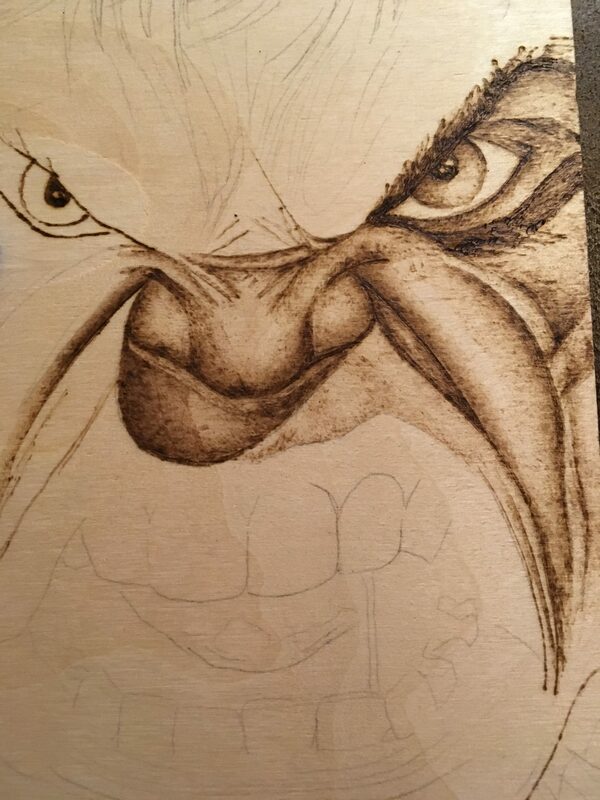 Once you have completed the burning, you may have some marks left on your wood from where you traced your design. These markings can’t simply be erased with a regular eraser. Get a magic eraser. Add only a little water to the eraser and gently rub in a circular motion evenly across the wood. If you don’t, you will have splotchy marks on your wood when you stain. If that happens, simply sand the wood down on those areas. If the image smears with the eraser, you may be rubbing too hard. Gently rub the eraser on the smudges until they’re gone. Let the wood completely dry. To give the wood a finished look, add a little stain on it. Be sure not to add too much stain or too dark of a stain or the image will fade into the wood. 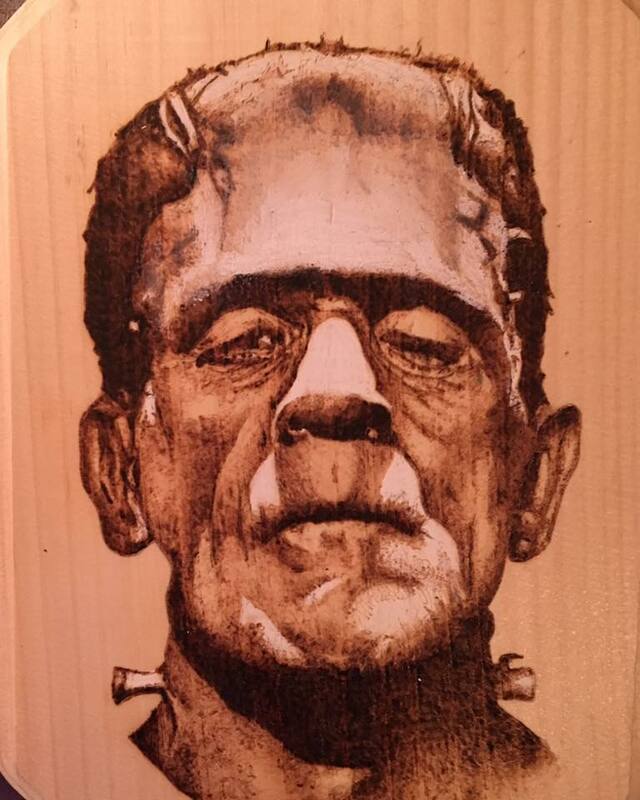 To protect the image from darkening over time, varnish the wood with polyurethane or resin. Now, all you have to do is enjoy all your hard work. Keep practicing and be patient with yourself. Hang in there, you’ll get it. I wish you the best of luck and I will see next time with some more tips to help you along the way. If you have any questions regarding the whole process, please leave them in the comments below and I’ll get to them as soon as possible. In a few more weeks it’s going to be that day where we all have the best excuse to get a little cheesy and tell our moms how special she is! I may have started a little too early on this but I couldn’t stop myself from feeling inspired so I went ahead and searched for a very simple yet very meaningful stencil for her, which I hope you will like. Use it as you see fit or let it inspire you to create your own. Tell me what you think about it! 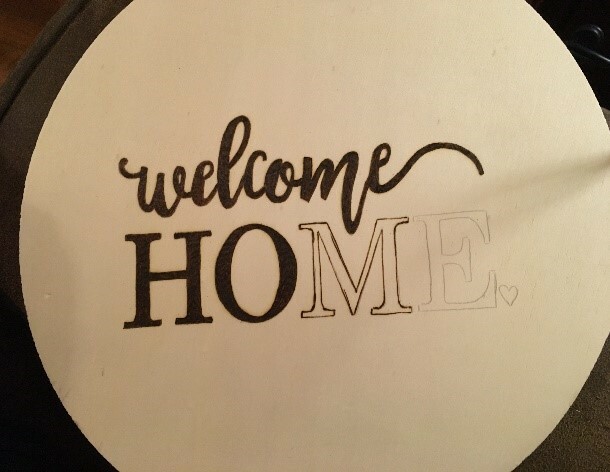 One major problem all commercial carbon transfer paper have is that its not easy to get rid of the accidental lines and smears made during transfers. If all those lines are going to be covered by your pyrography pen, that’s all well and good. But what if they don’t get covered with your design? The best way to get rid of them would be to sand off the affected area. Naturally, the darker the lines, the more sanding is needed. Furthermore, you can’t just sand that affected area if you want your whole work piece to be level. You would need to sand everything down. 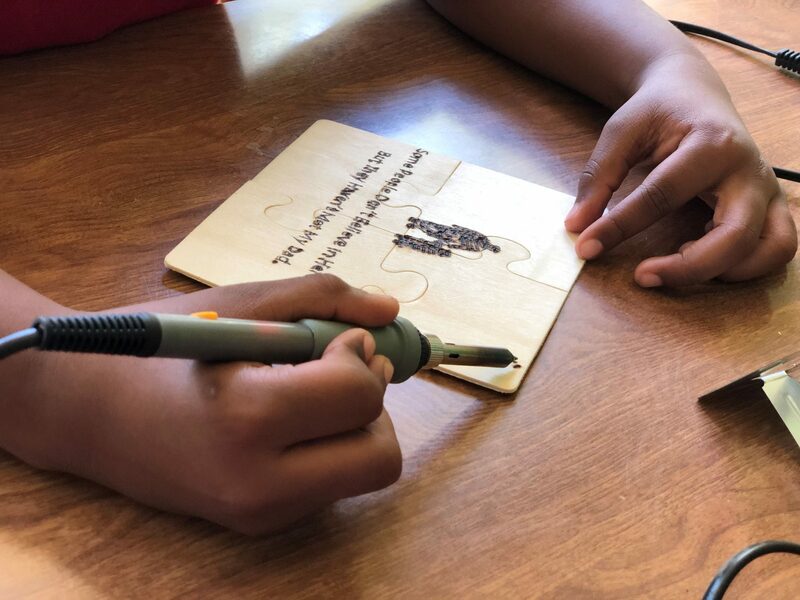 We don’t understand why transfers made from commercial carbon transfer paper cannot be erased by a simple rubber eraser. 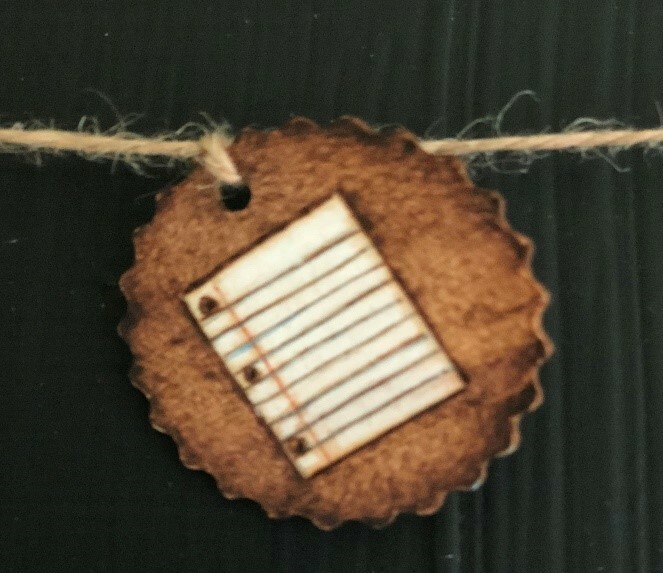 However, we have found an alternative that works quite well and is completely erasable – not to mention reusable too. Think of the savings! You probably already have all the materials in your house right now too so this is going to be an easy few minutes of a little elbow grease. Check out the short video clip below, see if it works for you or not and share your experience with all of us through the comments below.